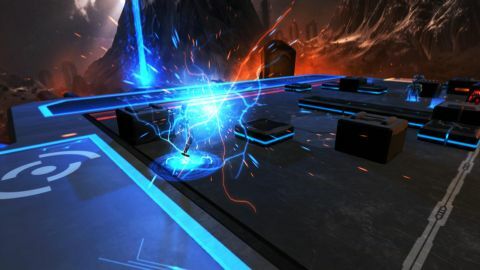 Theres a lot to parse, but understanding the nuances of Frozen Cortex reveals a deep strategic experience that stands shoulder-to-shoulder with Frozen Synapse. What is it? Turn-based strategy football with robots. After my first two hours with it, I was pretty sure I hated Frozen Cortex. Nothing seemed to work how I wanted it to, every play went badly wrong, and my AI opponent delighted in finding holes in my defense. If I weren’t obligated to push on, I probably would have stopped playing. I am really glad I didn’t stop. After I climbed to the top of the learning curve, I looked down the mountain and realized that Frozen Cortex is one of the deepest strategic experiences on PC. I thought it was broken to begin with, and I was so, so wrong. While the sport in Frozen Cortex is recognizable as a distant cousin of American football, it’s smaller, faster, and played by two teams of five murderous robots. The sport, known in the fiction as “Cortex,” plays out five seconds at a time. Coaches give five seconds’ worth of commands, then both teams execute at the same time. After five seconds or a major event (pass, interception, turnover, etc. ), both coaches adapt, issue new orders, and go again. The simultaneous-turn-based mechanic is unique in the turn-based strategy genre, and it worked great in 2011’s excellent Frozen Synapse. Where Synapse focused on the rules of close-quarters combat, Cortex abstracts tactical decisions by applying them to mankind’s original war simulator: sports. Stepping away from war makes Cortex’s tactics feel more essential and distilled. There are no gadgets of war like flashbangs or rockets. Without toys that go bang, you’re left with raw geometry: angles and vectors and speed. Unfortunately, stepping away from war, which provides rulesets that are bit easier to intuit, also gave me one more thing to learn, contributing to my horrible first few games. The tutorial covers the rules of Cortex the sport and little else, so I had to feel my way through a lot. Worse, the singleplayer campaigns include sports game standards like tournament and season play, but the difficulty is locked on standard and each game affects the income you have available for the rest of the season. Instead of this high-difficulty pressure cooker, what I really needed was a playground and training wheels. More than once I planned myself into a corner, maneuvering until I had a perfect run set up—only to be reminded at the last moment that ball carriers can’t run backward, or only three passes are allowed per turn. The AI, meanwhile, ruthlessly battered my rookie team like an exhibition match between a high school JV team and the Harlem Globetrotters. I lost my first match 27-0, and that score makes it sound like less of a rout than it was. I finally found some one-off exhibition matches against easy AI (exasperatingly, they were filed under the “advanced” tab). Once I found my playground, Cortex changed for me. Here’s where I was going wrong and, ironically, where Cortex shows off its true genius. During turn planning, I have the ability to preview the coming five seconds. During this preview stage, players can throw, run, block, and tackle, but the opposing team stays still unless told what to do. This is the key: in order to plan effectively, I have to give my opponent simulated orders, then plan to defeat those plans. I have to play both sides of every turn. In order to figure out how best to lock down every angle, I have to also work to thwart myself. Now, for those out there who always think three moves ahead this may not seem revelatory. But to me, it felt like religion. I am not a long-term strategic thinker, but Cortex pounded lessons into me until I started to adapt. Soon I was not only forcing turnovers, but knowing ahead of time what I would do once I got the ball. Even though Cortex offers a lot of single-player options, the real fun is in the multiplayer arenas. Finding a match is fast, and finding more matches to play while your opponent agonizes over her turn is even easier. I eventually had six games running at once, hopping back and forth like the proverbial chess wunderkind in Central Park. Additionally, the play-by-email system from Synapse is back. Enabling email notifications lets you log on, plot your turn, submit it, and go on with your day. When you get an email, it’s time to log back in and view the damage. I feel like this didn’t get a lot of attention the first time we saw it, but I really do appreciate it. Play by email is a great mode for gaming with busy friends or multitasking while, just as an example, writing a game review. It took me time to engage with Cortex, but once I figured out how to crack the game open, it began to teach me and mold me into the tactical thinker I’ve always tried to be. Cortex is teaching me to be a three-moves-ahead type of person, and that’s a great feeling that I’ve never gotten from war games.